• Barcode scanning of all 1D barcodes using handheld Bluetooth scanners like the CHS 7C from Socket Mobile, or any Bluetooth scanner supporting the HID profile. • Barcode recognition of UPC-A, EAN13 (including BOOKLAND), and CODE128 barcodes using the built-in camera (requires device with autofocus camera), and full range of 1D barcodes when using a Bluetooth scanner. 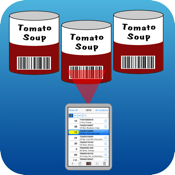 • Sorting by barcode or name, or leave items in "shelf order"
• "Pick and pack" mode for shipping applications lets you preload items and quantities, then decrement the count with each scan or tap, and vanish from the screen when the count reaches zero, leaving only items remaining to be packed. • For personal use, build up a database of your CDs and DVDs.